Hello Musicians! This month, we’re going to take a break from our series on musicality to look at some practical and fun practice tips to help you (or your child) have a wonderful summer of musical growth! I didn’t learn how to manage my time and practice effectively until I had been playing for years and was well into high school (and even into college) so I hope these ideas will help you in your musical journey! Make sure you understand WHAT to practice before you leave your lesson. Set up a practice schedule. Pick times that work well for you and write them in to your calendar. Practice the same day (or at least the next day!) as your lesson. Research shows you will retain dramatically more the closer you practice to your lesson day. Set up rewards. At our house in the summer, we have a list of things our boys have to do before they can have TV/video game time. It includes things like chores, reading, and music practice! This helps them stay motivated to finish their tasks and is hopefully teaching them to prioritize important tasks before lesser important ones. Find what motivates you/your child and reward with it after practice is accomplished. See live performances often. One of my teachers told me that a live show is worth 3 private lessons. They weren’t kidding! Sit up close and actively watch. It’s inspirational, fun, and you’ll learn more than you realize! There are just a few ideas to get you started. Have fun and make some music! Avi has been taking piano lessons for 2½ years, first with Karren Schiele, now with Sara Jenkins. 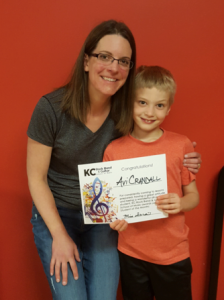 He has been doing a great job learning to work through challenges and master fun pieces of music! Why did you pick piano? Because it’s fun and makes a lot of great music. What’s your favorite song you’ve learned so far? Get Away! What are your other hobbies? Reading, coloring, playing with my pet Gecko—Dot, and soccer. Great job, Avi! We love seeing and hearing you make music!